Slipshod Slopes is the third level in Quiver Cliffs in the game Wario Land: Shake It! 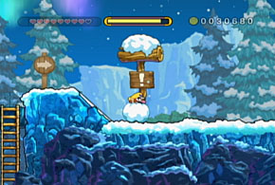 It is a level that is solely based on winter-themed elements. This level includes blocks of ice and icy ground too, along with the Snowman Wario ability. The background consists of icy mountains and evergreen trees covered in snow. It also introduces a new enemy: Pengoon. Many icicles grow from the ceiling, which can be used as platforms and can also defeat enemies. Wario would have to use an Earthshake Punch to dislodge the icicle though. The floor of this level is also very slippery and Wario will be sliding frantically if the player attempts to run. Once Wario finds the caged Merfle, he'll have to head back to the start before time expires. Samukaccha daichi Samukaccha Hills / Yard of Samukaccha; pun on "Kamchatka". This page was last edited on January 16, 2019, at 11:20.